A bid to the Rose Bowl on New Year’s Day? COMMENTARY – Theoretically speaking, let’s assume that you promised your daughter that if the Utes went to the Rose Bowl then you would take her to Disneyland as part of the same trip. How likely is it that you will have to make good on your promise? Let’s see. The commonly invoked phrase that “there is still a lot of football left to play,” becomes less and less true with each passing week. At this point, we are basically looking at a three-game season, with far more limited possibilities than existed even a few weeks ago. Utah is currently in third place in the Pac-12 South Division behind USC in second and Colorado at the top. But the standings are a little deceiving, so let’s dig a little deeper. The Trojans have played one more conference game than the Utes, resulting in a 5-2 conference record compared to Utah at 4-2. USC ends the season with road games at Washington and UCLA with the season finale being a home game against Notre Dame. If the Huskies are the team that they have been made out to be, then you chalk up at least one loss in those final three games (but only a loss against Washington or UCLA would count in the Pac-12 standings). Even assuming that the Trojans win out, then the Utes still own the tie-breaker by virtue of their win over USC earlier in the season. While Utah and Colorado sport identical 7-2 records overall, the Buffaloes boast a 5-1 conference record while the Utes currently sit at 4-2. Colorado is on the road this week at Arizona, followed by home games against Washington State and Utah. The Wildcats could be the proverbial trap game (0-6 in conference play, but pushing Washington to overtime in Tucson). The Cougars are 6-0 in conference play (winning by more than 20 points on average). It is very possible that Colorado drops one of those games. Even assuming that the Buffaloes win out leading up to the season finale with the Utes, then the winner of that game would hold the key tiebreaker for purposes of representing the South in the Pac-12 title game. Utah is on the road against Arizona State this week, hosts Oregon next week, and plays Colorado in Boulder for the season finale. The Utes cannot afford to look past either the Sun Devils or the Ducks (and Kyle Whittingham simply won’t let them), but both games should be very winnable. In that case, the season finale against the Buffaloes will be for all the marbles in the South and a trip to Santa Clara for the Pac-12 title game on Dec. 2, 2016. Washington is the presumptive favorite to win the North Division and the Pac-12 title as the sole undefeated team left standing in the Pac-12 when the last whistle blows. At this point, Washington State is the only other team that could potentially represent the North in the Pac-12 title game. The Huskies and the Wildcats will square off in the Apple Cup in Pullman, Wash., on Nov. 25. The winner will play in the Pac-12 title game. Ultimately, it shouldn’t matter who Utah plays in the Pac-12 championship game — if the Utes win, then they go to the Rose Bowl. So, it remains to be a true statement that the Utes control their own destiny when it comes to a Rose Bowl bid. 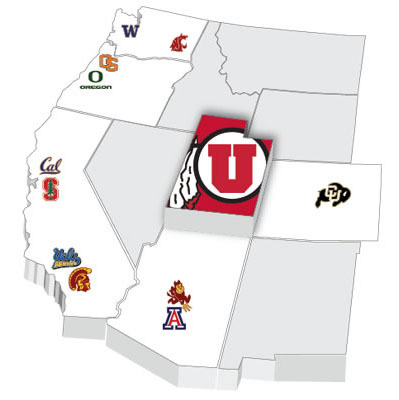 However, if Utah can just find its way into the Pac-12 title game, then they will likely have a safety net to give them a second bite at the apple for a bid to the Rose Bowl. In the event that the Utes play an undefeated Huskies team in the Pac-12 title game, then win or lose “everything’s coming up roses” for Utah. Again, if the Utes win, then they are the Pac-12 champion and will automatically play in the Rose Bowl. If Washington wins, then they should be part of the four-team playoff for the national title. In that case, “the Rose Bowl Game will select the next best team in the conference.” What constitutes the “next best team in the conference” appears to involve some discretion on the part of the Rose Bowl officials, but typically the next highest ranked team in the conference will get the nod. If Utah wins out, apart from another loss to the Huskies in the conference championship game, then the Utes should be widely considered to be the next best team in the conference. I freely admit that I am not completely free from bias and, at times, I can see the world through crimson-colored glasses. But I’m not alone in my belief that Utah is the odds-on favorite to represent the Pac-12 in the Rose Bowl. Both CBS Sports and SB Nation are currently projecting the Utes to play in the Rose Bowl. ESPN and Fox Sports are not expected to update their projections until tomorrow, but last week ESPN’s Mark Schlabach and Fox Sports’ Stewart Mandel both had Utah in the Rose Bowl. Are there still some naysayers? Of course. The Bleacher Report is projecting Washington State to play in the Rose Bowl while the Utes play in the Holiday Bowl, and last week ESPN’s Brett McMurphy concurred with a Holiday Bowl bid for Utah (again, an update is expected tomorrow). Here’s hoping the Utes take care of business against the Sun Devils in front of a national audience on Thursday night, keeping my daughter’s dream of a New Year’s trip to Disneyland alive for at least one more week.